Initially, I had not planned to attend First Thursday this month, given all the music shows and such. But at the last minute I decided to venture out on a very rainy evening and found some surprises. First, I visted Robert Koch Gallery, where I have found several interesting photography exhibitions over the past year. 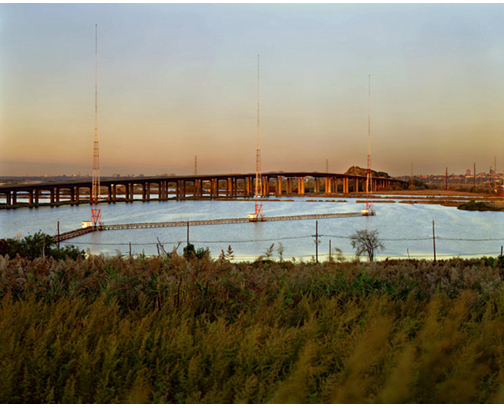 This month they were featuring the Meadowlands series by photographer Joshua Lutz. The Meadowlands is a sprawling area of marsh and landfill in northern New Jersey, just across the Hudson River from New York City. Growing up in New York, it was a place I passed by countless times on the New Jersey Turnpike, but really did not know. This is an experience that many New Yorkers have had with the Meadowlands, including Lutz. 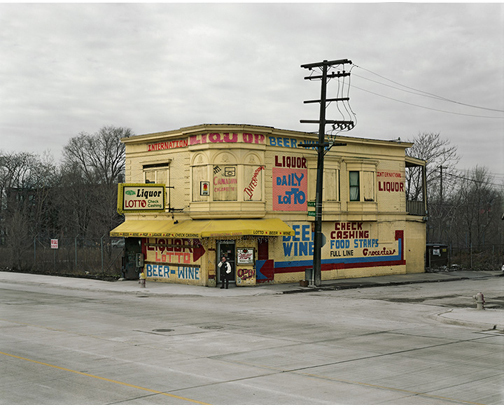 His photographs are part of a decade-long project that features both the natural and artificial landscape of the area (and how the two are irrevocably intertwined) as well as portraits of its residents. The are the highway structures over the marsh, familiar to the “drive by” experience, but also small-town storefronts and businesses, and portraits of individuals. These people and places are only a few miles from New York City but are a completely different world. And as Lutz points out, it is relatively challenging to get into and out of the Meadowlands from the highways, and easy to get lost inside. (I have my own experience taking wrong turns off the roads near the George Washington Bridge and having a hard time finding a way to get back on). One photograph I picked up on featured an older Indian man sitting among some plants near a truck stop, which was an interesting mix of subject, and seemed at once posed and spontaneous. Some of the places seem quite natural, with streams and trees, but there is always something from the human world that intervenes, a highway in the background, train tracks, the remains of a car, etc. Many of these images are reminiscent of decaying urban (and suburban) landscapes that tend to get my attention when I travel on my own. Lutz has turned his similar interest to other locations beyond the Meadowlands, and the exhibition also featured several photographs from his recent series Am✡Dam. You can see more examples at his or the gallery’s exhibitions page. As a side note, we realized that we both grew up in the same town just north of New York City at about the same time. Small world indeed! Across the street at Gallery Paule Anglim, I saw their exhibition of the work of James Castle. Castle was born deaf, never learned signing or lip reading, and apparently lived a very quiet and somewhat isolated life in a rural homestead near Boise, Idaho. He created unique works on small found objects and materials, such as bits of paper, matchboxes, and soot. Many of the pieces include both drawings and text, as in Unititled (3 Z $). The content, text and small images reminiscent of icons, feels very contemporary, although the materials and the texture of the work give it a more aged feel. Jack Fischer Gallery featured Josedgardo Granados’ incredibly intricate drawings. Although one can see many examples on his website, it is really impossible to see the detail except in real life. Even at full scale, one needed a magnifying glass (conveniently provided by the gallery) to see the individual lines of the drawings, which placed natural and sci-fi elements against detailed skies and landscapes. Mark Wolfe Contemporary Art presented “State of the Union”, a group exhibition in which artists presented images and interpretations on “events of the present and recent past at home and abroad.” Francesca Berrini’s maps of imaginary places, including Tributary and Lazy River, are created from torn maps of existing places – I was able to pick out some locations in North Africa and the Middle East. Alessandro Busci’s Rosso is an image in red featuring construction cranes over what appears to be a ruined landscape. The (now closed) exhibition Five Year Plan at Steven Wolf Fine Arts included large representation of a crossword puzzle by Kent and Kevin Young that caught my attention. The clues are missing, which of course makes the puzzle all but impossible to fill out.